So . . . um, yeah. Hope you like it. Last edited by Foomatic on Mon Apr 04, 2011 9:21 am, edited 20 times in total. OMG you are my new hero, FOO!! beautiful wallpaper! It's very beautiful, Foo. Stellar first attempt! You have a great eye for visuals, I love your videos and I look forward to more wallpapers from you, oh talented one. yeah you are really good. its your first wallpaper? wonderful!! Wow, Foo, it's great! And it's a first attempt too... another couple of tries like this and you'll be able to replace the header of your site with a much better one!! My eyes got stuck!!! woooo great wp like it...like it ...love it!!!! fantastic foo what more can i say? great job. looking forward to more of your creations. That is fantastic, Foo! Wow. I love the backdrop especially with the page and the written words. So great! Oh wow Foo... That's pretty magical... I am extremely impressed, escpecially for a first attempt... Keep em coming oh talented one! Pretty amazing for a first attempt! I can only imagine what else you’ll come up with after even more experience. This is great. Really nice Aly pictures and I like the text effect in the background. I hope this isn't the last wallpaper you'll make, I'd love to see more. Wonderful job on this! First WP??? I can't belive it! It's very cool! Great great job dude! oh, WOW! now, if only you could do one of amber, i would be most grateful! I'd like to thank everyone for their wonderful comments. I really appreciate it, especially coming from you seasoned wallpaper-ers. I think you guys have pretty guaranteed that I will spend countless hours toiling away at my computer with yet another Willow/Tara hobby to distract me. Ha! ETA: Changed it a little . . .
Last edited by Foomatic on Fri May 26, 2006 6:46 am, edited 1 time in total. Hey Foo, it’s great to see a second update from you. And another really nice one at that! 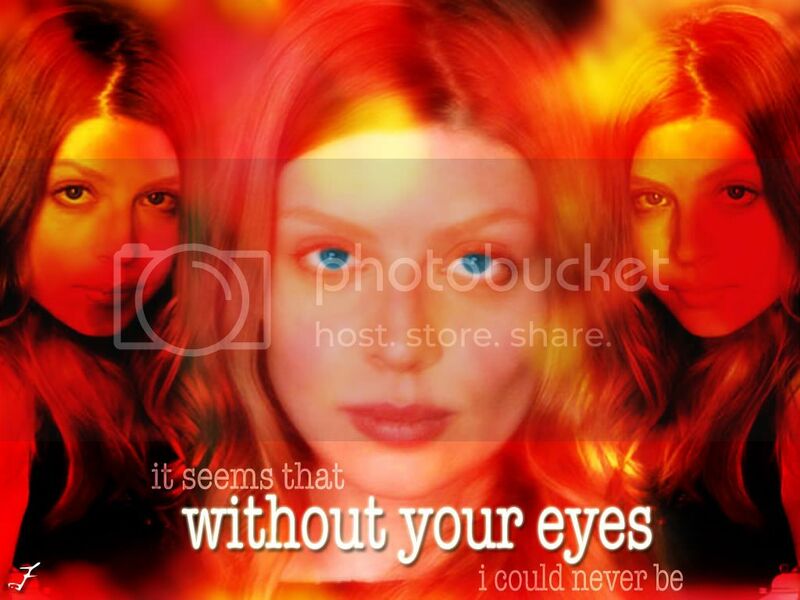 I love that you made a Tara wallpaper, she is my favorite, and yes her brilliant blue eyes are definitely captivating. I like the shades of color you used, brighter in some places while darker in others. And finally, that quote on the bottom. Love it. Great job and keep them coming. wow foo! what a fabulous tara wallpaper you made! the emphasis is definitely in the eyes and what beautiful eyes she has... you could lose yourself gazing at them! you definitely are getting the hang of wallpaper making! can't wait to see more of your creations! Hey! Excellent work! You really have a great sense of movement and color. Keep up the good work! It's good to see that you've tried making WP and perhaps, some fingersmith WP too? Sith: I went back and changed it when I read your post. Duh, eyes! So I did a little research and found a way to make them blue. Thanks for the comment! Renee85: The quote is actually from a Shakira song ("Eyes Like Yours (Ojos Asi"). I thought it was fitting . . . .
tarebear: The shade of blue isn't really the one I was going for, but it just 'popped' when I added it, since it contrasts the rest of the wallpaper. I'm glad you liked it! ambercissism: Hmmmm . . . Fingersmith wallpaper . . . need to schedule that in somewhere . . . Okay, is it just me, or do the pictures of Amber Benson on the left and right kind of look like Eliza Dushku? There's enough badness in the world, don't add to it. Well, it's been a while, but I got the graphic juices flowing. Last edited by Foomatic on Tue Mar 11, 2008 4:05 pm, edited 1 time in total. God, pulling at the damn heartstrings, I just looked again. Just that look on Tara's face in the first(one on the left) just...pulls at me. And as she melts into her own private hell, Willow is just taking the stage with hers. Her faces during those episodes when Tara loses it, you can tell she's barely holding on. Foo, this hurts so good, I can't stop lookin' at it! Great to see you back with a new update! This latest wallpaper is really well done, I love the shades of colors. The pictures you used are really sad to see, but they effectively display the desperation, sadness, and heartbreak in that moment. Nice job! Thanks so much for the comments. What can I say, I'm an angst whore. When I was choosing the stills for this particular wallpaper, I was struck at how much more emotional and heart rending the still shots were than the actual scene. The one with Willow's eyes closed and Tara screaming in particular, just breaks my heart. I was testing out some color effects I learned from tutorials I found online. It took me a while to get the right mix of colors, so I'm glad you liked it. Wow this wallpaper is... heartbreaking. I love this moment... It is heartbreaking but it shows the strength of their love. It is heartbreaking but it shows the strength of their love. Wow, that's exactly what I was thinking when I made this. Thank you! Last edited by Foomatic on Mon Jul 16, 2012 7:53 am, edited 1 time in total.